Angelo Dagrada built a number of F Junior cars in Milan during the early days of the formula, they had a very short wheelbase and were powered by a front mounted Lancia Appia V4 engine supplied by twin Weber 38 DCOs requiring a large bulge in the bodywork on the right. At the front independent links and coil springs were used with transverse leaf springs at the rear. Initially they were reasonably successful with several drivers, notably Giancarlo Baghetti who one a race at Monza, but the advent of the rear-engined British invasion saw their decline by the end of 1960. Not unsurprisingly a Dagrada-Lancia entered at Monza in May 1964 failed to prequalify. With the announcement of a new "Formula Junior" class in 1958, there was a remarkable flowering of individual designs to populate the grids of the new formula. Race car constructors from America, Italy, England, Germany and France grabbed whatever engine was close to 1100c--BMCs, Fiats, Fords, Renaults--and served them up in a bewildering variety of concoctions. Among the fastest, and certainly the loudest, are the eleven (?) cars built by Angelo Dagrada of Milan. Born in 1912, Dagrada earned a living as a mechanic, and built several race cars for the Italian 750 and 1100 cc races so popular after WWII. Building a reputation as a speed wizard, Dagrada improved upon the Fiat 1100-Siata head and combustion chambers. His cars achieved some significant wins, but a series of road accidents in the early 1950's put further race car activities on hold. But by 1955, Dagrada was once again in the speed business, this time with Alfas. Dagrada customers included the Baghetti family, owners of a successful foundry in Milan. To his delight, a teenage Giancarlo Baghetti was very interested in becoming a race driver. Baghetti's first car was "unsuitable for racing", and a secret arrangement with Dagrada ensured that the young Baghetti would have a faster car. "I remember Dagrada modified my father's Alfa 1900 sedan at night, when my father was not around," Baghetti told this author in a 1988 interview. "My father did not want a race car, just a nice family sedan. But when he picked up the Alfa the next day, he couldn't figure out why it ran so much faster." While Baghetti cut his teeth on Alfas and Abarths in local events, Dagrada was dreaming of a special car to compete in the new Formula Junior. 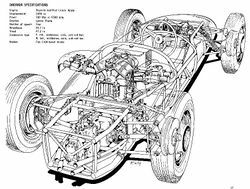 Chassis design, pre-Chapman, was simple, primitive, and not always effective--a tubular frame with Fiat 1100 front suspension and whatever live axle fit at the rear. Dagrada, always an engine man, would do it his way. While virtually every other Italian Formula Junior constructor chose the Fiat unit, Dagrada took a good look at the 1098cc Lancia Appia engine. Featuring a sturdy 10-degree V-4 cylinder cast-iron block, the Appia was the right displacement, readily available and relatively light. However, it suffered with an intricate aluminum head that stymied any attempt to make it a breather. Dagrada's modifications to the Lancia head were diabolic. He virtually re-designed the head, creating new intake and exhaust ports. The Appia suddenly became a fire-breathing cross flow head. Hanging a Weber 38 DCO from each side of the block, he then tuned the exhausts for maximum effect, capable of eardrum-busting decibels, unevenly pulsating from two megaphone exhaust pipes (although some used a combined system). This recipe just about doubled the horsepower from 48 bhp to somewhere around 100 bhp. Dagrada then graced this with an aluminum body reminiscent of the Maserati 250F. By 1960, young Baghetti was eager to race in the new Formula Junior, and bought a Dagrada from his old friend. Entering a series of training races, he won the first time out on March 27th at Monza, and placed well in three other events, winning the Vigorelli Trophy races on April 25th. In the spring of 1961, Baghetti's chief mechanic pulled him aside and told him that "Mr. Ferrari wants to speak to you." "I thought he was joking, but it was true," said Baghetti. The rest is history.